Jerusalem’s secular mayor, Nir Barkat, has pitted himself against the city’s swelling ranks of ultra-orthodox extremists by demanding that local police enable women to reclaim their position in the public domain. Over recent months, women’s faces have disappeared from billboards across the city amid mounting pressure applied by the powerful ultra-orthodox lobby, who find the female image offensive. Several advertisers have erased female models from their posters in Jerusalem. Elsewhere in Israel, the winter campaign of Israeli clothing brand Honigman features a model cosily dressed in winter knits. In the capital, the woman’s head has been removed from the image, leaving just her arm and a handbag. Companies that do not fall in line with the standards of the extreme ultra-orthodox have frequently fallen victim to direct action. 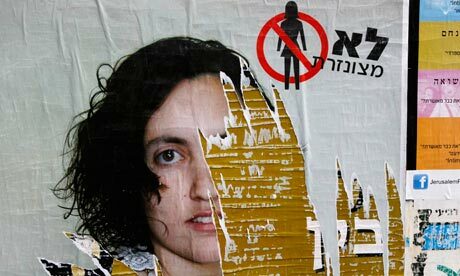 Across Jerusalem, female figures have been blacked out of billboards with spray-paint, or vandalised with graffiti branding the image “illegal”. Other posters are simply torn down. Police have confirmed an increase in vandalism on the borders of Jerusalem’s closed ultra-orthodox neighbourhoods. Spokesman Micky Rosenfeld said police would be stepping up patrols to prevent further acts of hooliganism and ensure it is investigated. Rosenfeld added that despite being pelted with stones, police officers made several arrests in the orthodox Meah Shearim neighbourhood last week. But activists claim the battle over Jerusalem’s billboards is only one manifestation of an alarming trend towards gender segregation across Israel driven by the religious right. Activist Hila Benyovich-Hoffman was spurred to take action by reports that nine male cadets in the Israeli Defence Force had walked out of an army event in September because women were singing. Four were expelled from an officer’s training course for refusing to apologise. “This was the final straw for me, that these cadets could humiliate female soldiers because some rabbi has told them that a woman’s voice is indecent. The army used to be a source of pride because women served alongside men as equals. But more and more, rabbis are influencing army behaviour,” Benyovich-Hoffman said. She organised a series of demonstrations last Friday in which hundreds of women gathered for “singalongs” in Tel Aviv, Jerusalem, Haifa and Beersheva to demand their right to a public presence. She says much more needs to be done. It is not just secular Israelis that have been moved to protest. Members of the Haredi ultra-orthodox community themselves are reporting a rise in assaults on women. One orthodox website reported this week that three orthodox girls had been physically attacked in Jerusalem for dressing immodestly. The Israeli Religious Action Centre (IRAC) was founded more than a decade ago to take on the fight against gender segregation, which is illegal in Israel. They receive around four calls a day from mostly orthodox Jewish women complaining of segregation in medical centres, on pavements, in post offices, graveyards and, most often, on buses. The centre estimates that daily, between 500 and 600 bus journeys in Israel are segregated. Jerusalem’s deputy mayor, Naomi Tsur, admits the situation is “deplorable” but also says that women’s rights have never had a better chance of flourishing in Jerusalem. For decades until November 2008, under the leadership of an orthodox mayor, billboards featuring women simply weren’t allowed in the city.